By Chris Williams: Trainer Freddie Roach has had some seriously rotten luck as of late with pretty much all of his top fighters getting beaten recently. 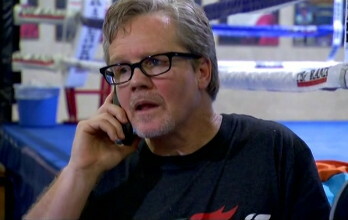 Roach has seen Amir Khan twice under his helm as well Jorge Linares tasting defeat, Manny Pacquiao and now Julio Cesar Chavez Jr. Khan recently decided it was time to leave Roach and go with another trainer to try and turn his career around before it’s too late after he was blown out by Danny Garcia and narrowly beaten by Lamont Peterson. However, Pacquiao will be sticking with Roach despite his recent loss to Tim Bradley. At this stage in his career, Pacquiao is probably better off staying with Roach because it would be difficult for another trainer to do much with Pacquiao with the limited amount of time that he has left in the sport. Pacquiao’s entire game has been centered around his speed, power and all out attacking style of fighting. The speed and power is still there, but the stamina and aggression isn’t the same for Pacquiao like it was three years ago. If Roach can’t bring Pacquiao back to the busy fighter that he once was, then I doubt anyone else can do it either. Pacquiao’s legs cramp up when he moves a lot, and that just seems like a physical thing more than something that would change if he were to boot Roach and go with another trainer. The best thing that Pacquiao could do is to move back down in weight to the light welterweight or lightweight divisions where he’d be lighter on his feet and much faster. He’s had to eat a ton of food to keep his weight up high enough for him to fight in the welterweight division. It’s easy to see why his speed has gone down when he’s fighting out of his natural weight class. The reason why Pacquiao is fighting at welterweight is because this is where all the big money fights are at. He’d probably prolong his career and fight at a much better rate if he moved down to lightweight, but then there wouldn’t be the big fights agaisnt the likes of Floyd Mayweather Jr. if Pacquiao did that, not that Arum has ever put Pacquiao in with Mayweather.